Projects Abroad also offers group trips for various community groups and organisations, such as Scouts, Girl Guides and Young Farmers. These trips allow individuals and friends from various locations to come together with others from within the same organisation to volunteer on a project that is bespoke to them. This is a great opportunity for people who share the same interests to meet each other and get involved with volunteering work that will benefit communities and ecosystems all around the world, as well as themselves! 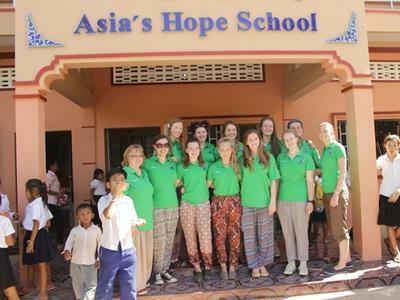 Since 1992, Projects Abroad has been specialising in arranging volunteer placements in communities around the developing world. We currently operate in 30 different destinations and, over the last few decades, we have sent over 100,000 volunteers from each corner of the globe to volunteer on a huge variety of worthwhile projects. In that time, volunteering as part of a group has grown dramatically and the variety of groups that we currently work with reflects that. Projects Abroad are happy to come and visit you to talk about the trip, before you’ve even signed up. In recent years, many organisation groups have been planning annual trips with us, whether it’s to a new destination each time or not! 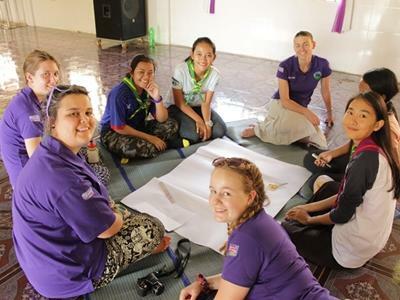 The Girl Guides organisation has sent groups from it’s Slough, Anglia, Midlands and Warwickshire regions to a variety of our locations including Nepal, Sri Lanka, Ghana and Cambodia. If you want to have a read about what each group got up to and what they thought about the trip, follow the links below. It doesn’t matter where your group or organisation’s interests lay, we can find a project and a destination that will put your skills to use and benefit both yourselves and the community in which you are working. Whether it’s a building project helping to rebuild homes and classrooms in Nepal for those with an interest in construction, or a marine conservation project studying and helping to preserve the unique reef habitats in Thailand for those with an interest in protecting our coastal habitats, we’ll plan a bespoke trip suited to you. If you want to read an example of a previous community group, please see Anglia Girl Guide's case study. If you want more information on the types of projects that your community group can get involved with, please see here.